There may be hope for Jimmy Butler to mend fences in Minnesota after all. It appears ex-Thunder teammates Kevin Durant and Russell Westbrook are on better terms. Durant started following the Thunder point guard on Instagram Saturday. 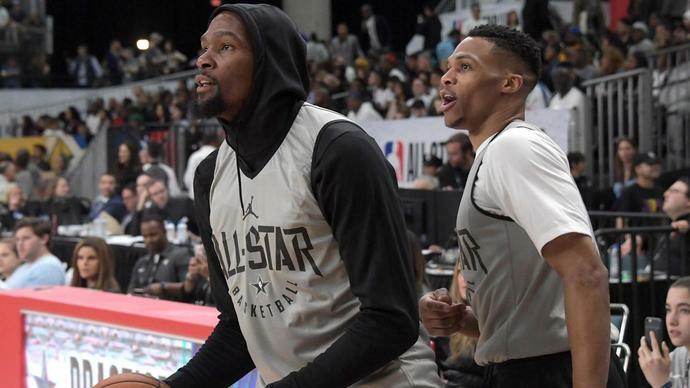 Durant and Westbrook played together for eight seasons in Oklahoma City, but their relationship seemingly turned sour after Durant joined the Golden State Warriors in free agency in 2016. Westbrook was reportedly not happy Durant spurned OKC for the Bay Area, and the two jawed at times during various Thunder-Warriors tilts. But the icy relationship seemed to thaw at February's NBA All-Star Game in Los Angeles. Durant and Westbrook once again played for the same team, and looked like they were enjoying themselves. That was a departure from the previous year -- Durant's first with the Warriors -- and the back-to-back Finals MVP took the blame for their beef. "I feel like I f---ed that up," Durant said at the time. "I feel like I made it a thing when it a thing when it shouldn't have been." For his part, Westbrook said the weekend in February was "normal." But, as of this writing, Westbrook still does not follow Durant on the platform. He did, however, post this image on his Instagram Story to show where he stood. Well, where he stood physically, at least.